Certified Management Accountant(CMA) is a USA based certification, overseen by the IMA (Institute of Management Accountants). From the last few years the CMA has been growing and spreading its global presence, and is now well known in China and throughout the Middle East. Chartered Institute of Management Accountant(CIMA) certification is handled by the CIMA (Chartered Institute of Management Accountants). The CIMA is recognized in many countries, especially those in the UK and commonwealth. Q.:Which course is more beneficial CMA or CIMA? Answer: CMA certification is a great ascription for management professionals who are looking for enhancing their knowledge and skills in the financial management fields. The course prepares a professional with skills in the area of financial planning, analysis, control, decision support, and professional ethics. In case of CIMA, it gives knowledge and insight into how the different areas of accounting relate to the business world. This accounting qualification is most relevant to the current trends of the industry, helping candidates to unleash their talent and accelerate their career in the business field. So, depending upon your preference of field that you want to work in and build skills around, the benefits differ. Hence it is difficult to generalize which certification is better as both of them cater to people with different aspirations. Q.:What is the Requirements/Eligibility Criteria to pass CMA and CIMA Exam? Answer: The eligibility criteria can be defined on the basis of Education and Experience. CMA:A bachelor degree from a recognized university is required to get qualified for the CMA exam, but there is no eligibility for CIMA exam. CIMA:Everyone can do CIMA course program because CIMA itself offers a more rigorous program. In case of CMA certification no experienced is required. But in case of CIMA Candidates must have 3 years of working experience in related field. Answer:The CMA certification is provided by Institute of management accountants, America while CIMA is given by Chartered institute of management accountants, UK. Q.:What is the registration fee for each of the courses? Answer:CMA’s registration fee for students is $ 476 and professionals are $1030 whereas for CIMA it is GBP 75. Q.:How many papers do you have to give? Answer:If you are doing CMA you have to give 2 papers at a single level and if you pursue CIMA you have to give 16 papers at 5 levels. Q.:When does the exam take place? Answer:CMA exams can be taken in January –February, May-June or September- October. CIMA exams can be scheduled according to you. Q.:How long will it take to complete the course? Answer:CMA takes a minimum of 6 months to a year to complete while CIMA can take up to 3-4 years. Q.:What jobs can I get after completing the course? Q.:What would be my average salary? Answer:A CMA’s salary would be $33,500 which would be approx. INR 21,30,000. A CIMA’s salary would be $ 33,000 which would be approx. INR 21,00,000. Q.:Where should you go to visit the official websites? You can schedule your exams accordingly. 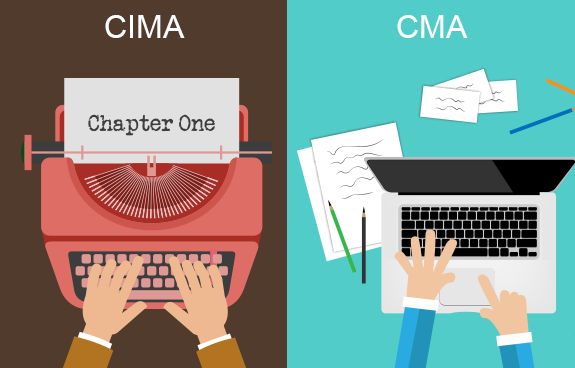 Hopefully, you have understood the difference between CMA and CIMA. If you have any queries you can mail us at help@edupristine.com. To know more about CMA and its training visit our page.